Modern casinos offer a great variety of slot machines that suit all tastes and offer various more or less favorable payout conditions. One of the most famous slots types is reel slot machines seen as the traditional model of slot machines that has basically remained unchanged in the course of slots history. Reel slot machines (or mechanical slots) have reels with certain symbols imprinted on each of them and additional blank spaces. The most popular models are the ones with three and five reels, although there are slots offering seven and even more reels. The symbols on the reels are based on the certain theme of the machine. Most modern thematic slots feature symbols based on popular TV game shoes, like the Wheel of Fortune, movie and cartoon characters or popular actors and singers. The classical reel slot model has symbols of fruits, like cherries, lemons or plums. The number of symbols on the reels is different with different machines. When the reels stop spinning, they stop at certain combinations of symbols. In case any number of identical symbols appears on the payline with the stop of the reels, the player will get a prize according to the slot payouts table available on the machine's face. Modern reel slot machines may actually have more than one payline, which requires more coins to activate more additional paylines, like in the multiline straight slots. At the same time it offers the use of various extra features like bonuses and multipliers. With the higher number of paylines the number of possible winning combinations increases, which enables higher payouts. The history of slots began with three reel slot machines, when the original Liberty Bell machine was introduced in 1895. 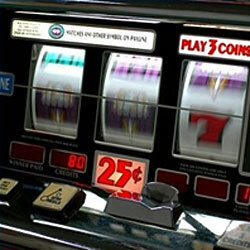 Three-reel slot machines soon gained vast popularity. Nowadays three reel slots are available in both land and online casinos (although reel slot machines in online casinos are actually video slots with graphically simulated reels) and are possibly the most popular slots type in the world due to their simplicity. Three reel slots offer various payout opportunities, like games with multiple coins and paylines, multipliers, bonuses and high jackpots. The slot machines odds of winning jackpots increase when the player makes maximum bets on maximum paylines. Five reel slot machines were developed as an extension to the classical model with three reels. This type of reel slots offers increased number of paylines and possible winning combinations compared to that in the tree reel slots. Even though the odds of hitting a winning combination are lower in five reel slots, they offer higher payouts. The number of paylines in five reel slot machines may reach 25, 50 and even 100 lines in super multiline slots. Increased number of paylines offers higher payouts, but prior to playing five-reel slots with multiple paylines it is necessary to look through the payout table to define the conditions for winning jackpot, as most multiline slots require additional coins for each next line. Hitting the highest jackpot, in its turn, requires that the player bets on maximum paylines.